In my opinion the beauty of natural landscapes and plants cannot be visualized realisticly. The beauty is so transcendence that the human perception is not able to express it visually and narratively [Schwepenhäuser2007, pages 88-89]. 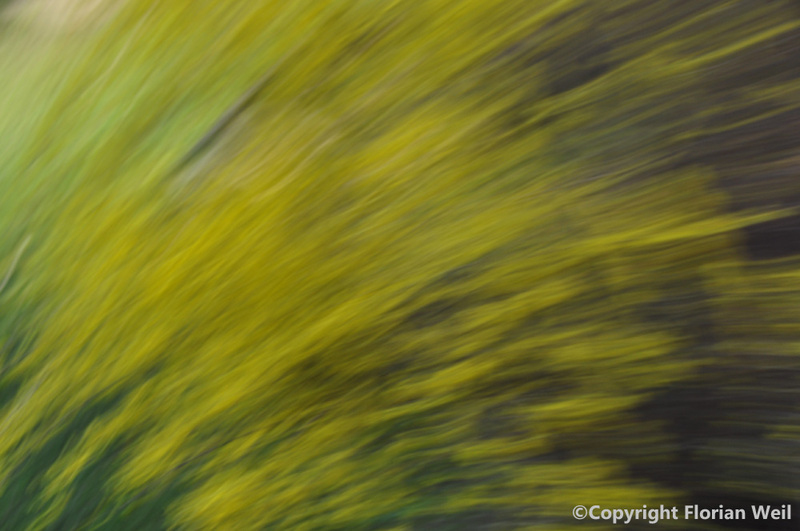 In consideration that only an abstract approach provides a freedom for the viewer to connect own experiences of natural elegance with a visual representation of nature. This idea is based on the “Colour Field” painting movement, which dealt with the landscape-derived imagery of an abstract expressionism (e.g. artists like Jules Olitski )[Kastner2012, page 99]. 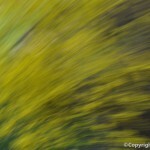 The concept of a free interpretation motivated me to deal with an abstract expression to visualize nature’s beauty. During my research on human perception I figured out that people perceive nature and plants differently. Depending on their cultural background and their childhood experiences, they feel more or less connected to the beauty of nature (see “2.3. Ethnobotany” on page 25). This individual interpretation that an abstract visualization enables can be harmonically combined with the human’s subjective perception of nature. Therefore, I have chosen the abstract approach, so that people can perceive the beauty of plants in their on individual way as Umberto Eco described it [Eco1977]. In his publication “Das offene Kunstwerk” (1977) he claimed that every perception of an artwork is subjectively interpreted. Accordingly to him, this subjective interpretation depends on the environment in which an artwork is embedded and the viewer’s cultural background, interests and moods. 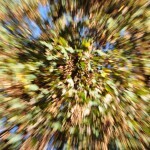 Visual changes within a natural environment appear through time or movement. Both factors are omnipresent in our live. 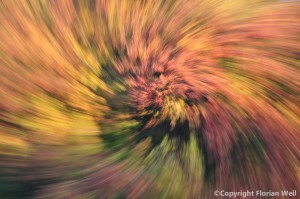 The photo series “Season Patterns” plays with these visual changes induced by time and movement. 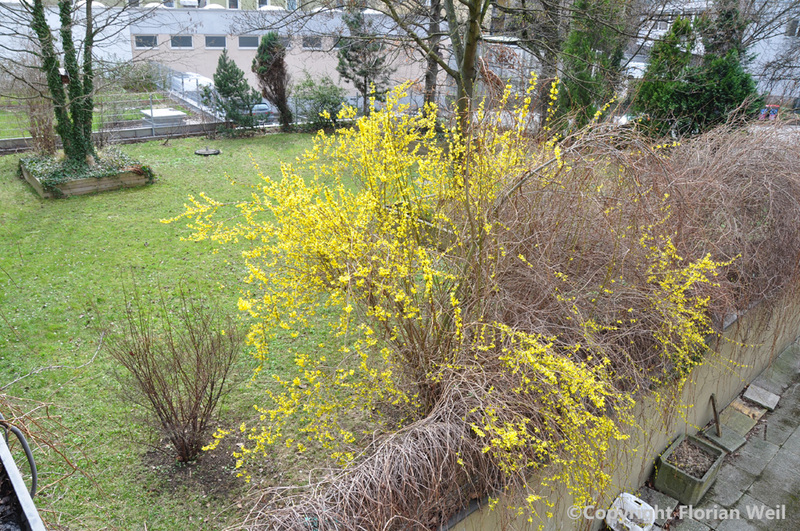 For instance, the visual appearance of plants change massively over a year. 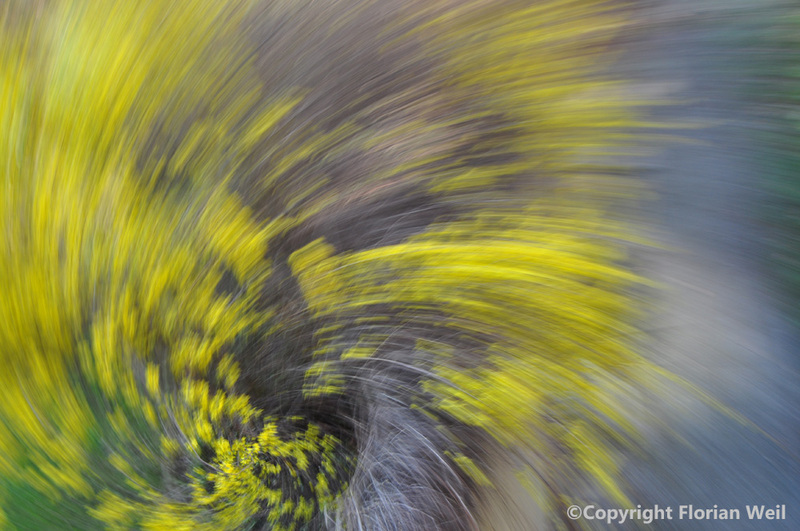 The used abstract photography approach reduces the visual appearance of plants on its basic shapes and colours. 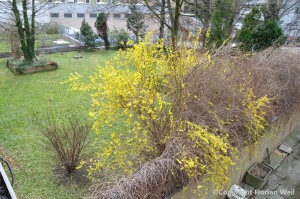 Over two years, photos were taken in Linz (Austria) and Berlin (Germany) during all seasons. 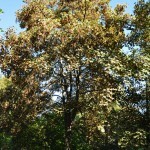 A comparison of each photo from a particular season reveals different colours and shapes caused by these seasonal changes. 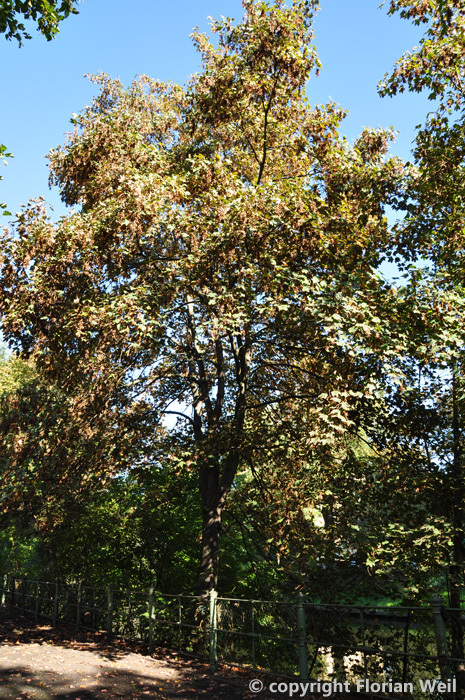 Every season provides its own expression of beauty and uniqueness. Movement causes visual changes and exactly these variations are addressed in this artwork as well. It holds also a reference to human perception of an environment while the person changes its location (locomotion). Humans are only able to focus on certain areas in an environment. The rest of the situation is perceived unconsciously. 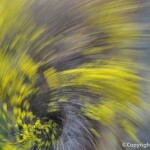 Each photo of this series addresses this unconscious perception of plants and natural habitats. The camera is moved slowly or quickly during the process of taking the photo. The movement of the camera represents the human activity of fast locomotion through a natural landscape or a glimpse across a natural space. 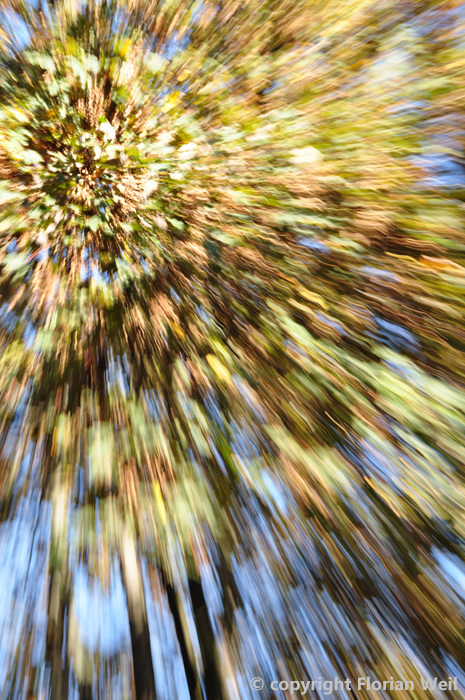 The outcome of the movement are photos with a strong motion blur. 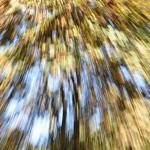 The motion blur is used on purpose for reducing the details of the natural visual presentation. 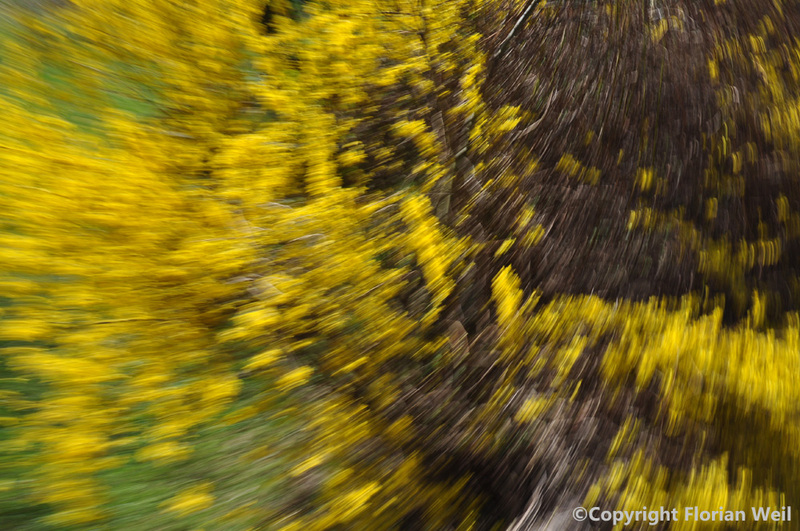 Previous shapes and colours get merged by the motion blur and new structures of the environment become visible. These new structures can be compare to the human visual perception during a glimpse or fast head shifting. “Seasonal Patterns” during Spring in Berlin (2012). “Seasonal Patterns” during Summer in Linz (2011). 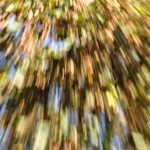 “Seasonal Patterns” during Autumn in Berlin (2012). “Seasonal Patterns” during Winter in Berlin (2012). All photo of the series “Season Patterns” were token with the digital single lens reflex camera (DSLR) Nikon D90. No post production was applied to the photos, to have the visualization as authentic as possible. The usage of long time exposure and the moving camera has its origin from my previous photo series “The dynamics of static light” (2009-2011). Inspired by the light sculptures “Night-Time Traffic” (1937-1946) from László Moholy-Nagy. I captured the structures of static lights sources in an urban environment. 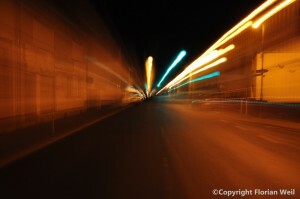 Instead of capturing moving light sources as it is usually done in Light Graffiti or Light painting artworks, the camera is the moving object and the environment the static component. The result is a photo presenting a snapshot of the motion and the blurred light sources. In my view the field of size is still recognizable however through the camera movement the photo reveals an interesting impression. 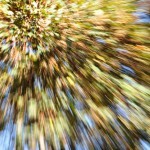 It can be interpreted in how fast a motion through this environment have to look like for our consciousness. Moreover, it also reveals the impact that light design has on the human perception. 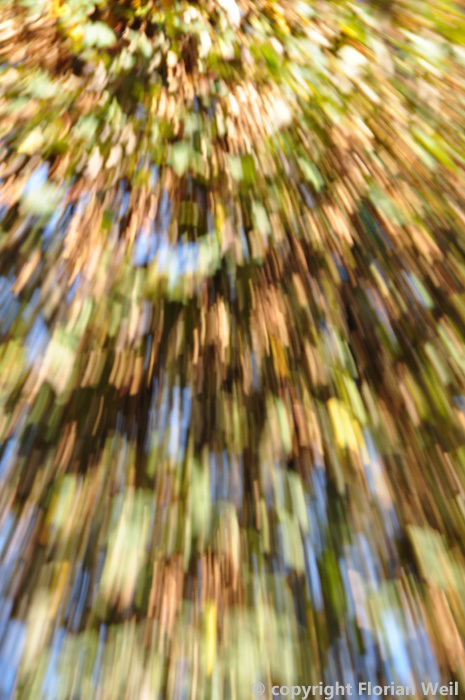 I adapted the “The dynamic of static light“ method for the “Season Patterns” photo series. 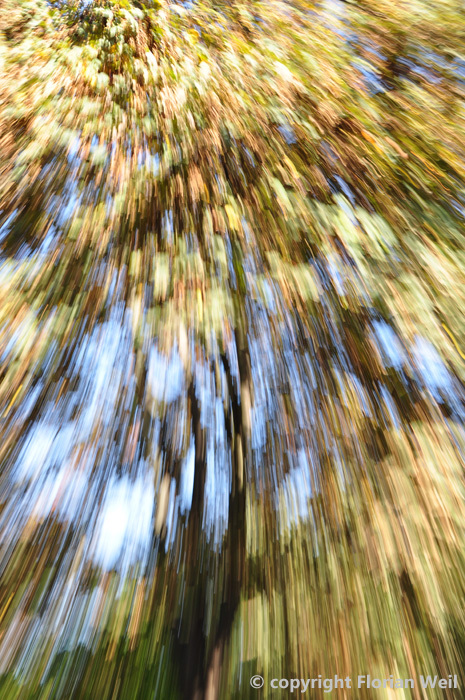 Working with long time exposure during day holds its own complexity. The photo series “Yurikamome line” (2010) and “Millennium line” (2012) by Céline Ramoni reveal patterns of urban environments through long time exposure and a moving camera. Especially the detailed lines and colours caused by the movement, influenced my work and artistic process. 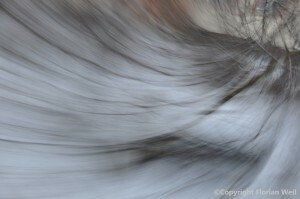 Furthermore, the abstract photographer Stefan Heyne inspired my work in relation to the usage of blur. 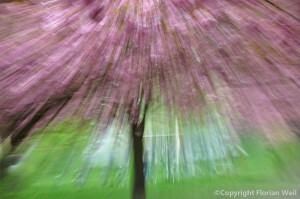 He established his own visual aesthetic of using the combination of depth of sharpness and blur. Moreover, his concept of visualizing lines, shapes (see his artwork “4367” and “4382"), and colour gradients (see artwork “6341”) fascinate me. 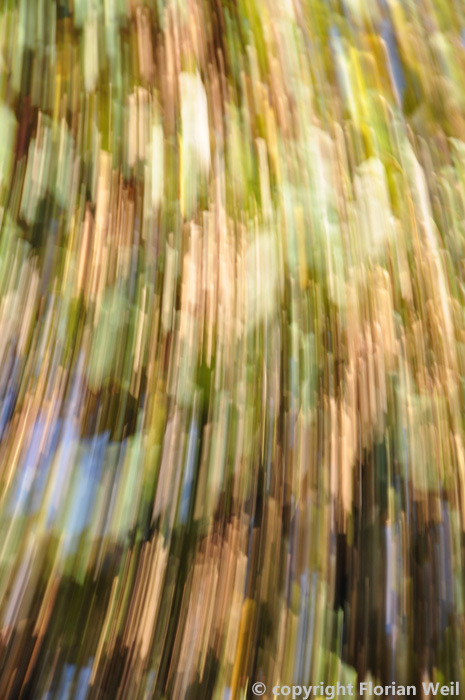 His aesthetics influenced my work while I taking close up pictures from plants with my motion blur and long-time exposure approach. An additional impact on my artistic work was the contemporary landscape paintings by David Schnell [SteStuSchn2010]. His work “Depot” (2008) gave me an impression about the colour sets that nature provide us with. The painting “Blau” (2010) is a great example of structures and patterns that exist in plant based environments. Beyond these both paintings, one of the biggest influence were the painting “Moment” (2010). His unique usage of perspective in this painting had such a strong impact on me that I cannot deny the connection to my approach of perspective. 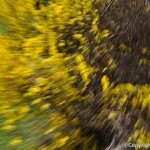 I intended to create his dynamic effect through a motion blur created by a fast zooming action during the photo shoot. While the visual aesthetics of my work were influenced by fine artist. Generative computer art had an influence on my methodology of taking the photos. In computer based generative art the artist defines an algorithm, which can be determined as a rule set for the computer. These lists of commands are computer readable descriptions of drawing a painting [Reas2010]. In my case I defined a fix rule set of movements for creating the perspective and motion blur effect. I combined these movements with different shots of field size. The usage of the different shots generates completely different shapes and patterns. Depending on the natural environment and the season the photo became more colourful or contained different hue ranges of one colour. The natural environment captured in its normal presentation. 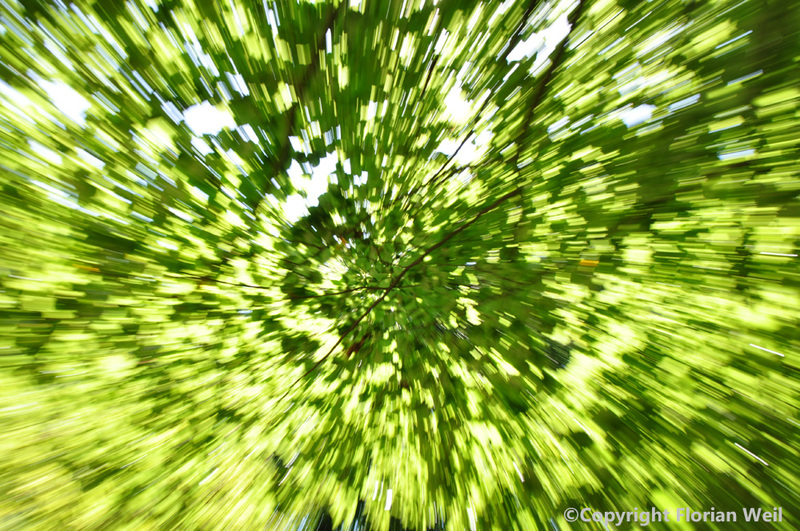 The abstract photograph approach with a rotation and zoom movement. 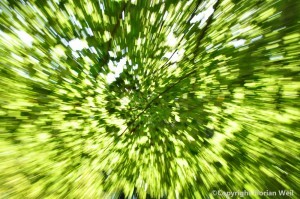 The abstract photograph approach with a fast diagonal movement. 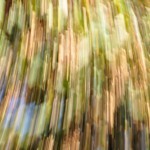 The abstract photograph approach with a less rotation and camera forward movement. The performed movement on each photo depends strongly on the characteristic of the environment. If it is a place with plenty of space then a zoom movement will be executed in combination with a long shot. Areas with less space require strong horizontal, vertical, and diagonal movements in combination with close-up or medium shots. 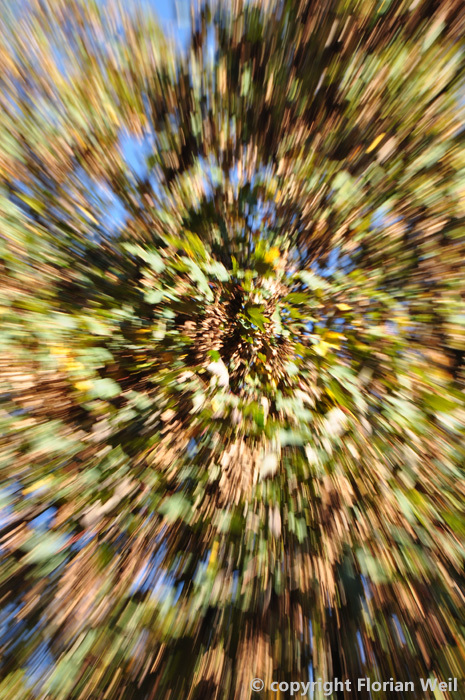 The abstract photograph approach in a transitional shot between medium and close-up. During the creational process of the photo series “Season Patterns” I could experience and I could understand the seasonal changes of the natural urban environment. Furthermore, for this work I did long walks through Linz and Berlin. These strolls enabled me to observe plants grow in different forms, shapes and places within these cities. Plants were used to beautify its environments and others for protection or as boundaries. The experiences I could gather in the making of the photos are less scientifically oriented, although the better understanding of plants in the context of an urban environment was a great benefit for me. These new understanding and findings helped me to develop the next projects “Travelling Plants” and “Dead Tree Drop”. [Schwepenhäuser2007] Schweppenhäuser, Gerhard (2007). Ästhetik: Philosophische Grundlagen und Schlüsselbegriffe. Campus Verlag, 2007. [Eco1977]Eco, Umberto (1977). Das offene Kunstwerk. Suhrkamp Verlag, 1977. [SteStuSchn2010] Stegmann, Markus; Stuffer , Ute; Schnell , David (2010). David Schnell: Stunde. Hatje Cantz Verlag, 2010. [Reas2010] Reas, Chandler Casey (2010). Form+Code in Design, Art, and Architecture. Princeton Architectural Press, 2010. The artworks Span (1962), Photogenic Landscape (1965), Color Systems (198x), Individual Theme Nature and Cactuses (1977) by Gottfried Jäger are definitively an inspiration of my photo serie.